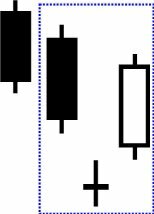 If the second and third day candlesticks open at or above the midrange of the previous day, this signifies that the trend will continue. 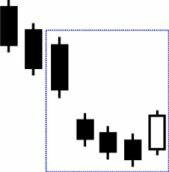 This pattern start with a long black candle (part of a downtrend), it is followed by a gap down doji and finally on the third day a white candle is formed with a gap up. This pattern shows a potential rally. Many positions have changed for seller to buyer in this instance. It is the third white candle where the bullish signal can be confirmed. Be concious of the gaps since this will give you information as to the strength of the signal. The three river morning star is the opposite of the three river evening star, this is it's bullish equivalent. This is a multiple day pattern. It starts with an established downtrend. On the second day the stock gaps down with a smaller black candle. On day 3 and 4 the candles are small but closing downward. On the last day of the pattern a large white candle is formed.